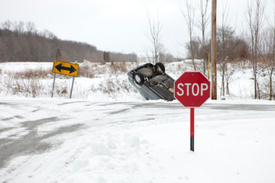 Legal news for New York SUV rollover attorneys –New York State Police report a Syracuse University student sustained life threatening injuries in an SUV rollover in Lafayette, NY. LaFayette, NY (NewYorkInjuryNews.com) – A Syracuse University student was hospitalized after her SUV rolled over on Lafayette Road at 8:45 a.m. Tuesday morning, according to WSYR-TV. New York State Police responded to the scene of a one-vehicle accident where the driver was found outside of her damaged vehicle in the snow on the wintry morning. Police reported that the woman identified as 21-year-old Rachel Pigott, resident of Utah, was ejected from her SUV after her vehicle rolled over several times. Paramedics arrived in an ambulance to transport the severely injured woman to University Hospital. Doctors and nurses treated Pigott’s potentially life threatening injuries, although they were not specified. Police said that speed was a factor in the SUV rollover. It was not known where Pigott was headed at the time of the accident. There were no passengers in her vehicle at the time. Police reported that Pigott got caught up in the snow on the side of the road near Reidy Hill Road in LaFayette, when the crash took place at 8:45 a.m. She was listed in critical condition. There were no tickets issued in connection with the wreck.